It's essential that you're able to clearly communicate with your wedding party members to ensure a smooth planning process. Here are some options when it comes to how to make that happen. Frequent and clear communication is the key to a successful wedding party. 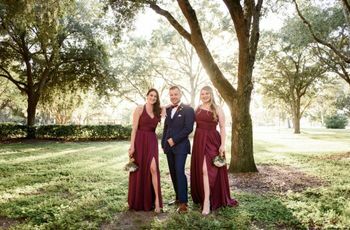 As the bride or groom, you’ll need to chat with your wedding party often, whether it’s a reminder to order their attire in a timely fashion or details about the wedding-day timeline. But how can you reach out to your wedding party in a way that gets their attention but isn’t overwhelming? Turns out there are lots of options when it comes to easy modes of communication in today's technological age—you’ll just need to pick the one that works best for your crew and stick with it to avoid confusion. 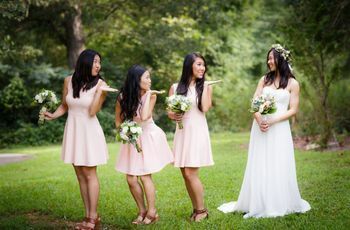 Here are the top eight ways to communicate with your wedding party so you can select the right one for your nearest and dearest. If you and your crew are already frequent texters, you might think that a group text or GroupMe might be the best way to communicate with the group. While a text message is hard to ignore, group texts can also get out of control quickly, especially if you have a larger wedding party. You don’t need your phone to be blowing up constantly, and there’s a possibility that important texts will get ignored if there’s too much activity. Also, it can be difficult to refer back to old text messages which can be problematic (“Wait, which hotel am I supposed to be staying at?”). 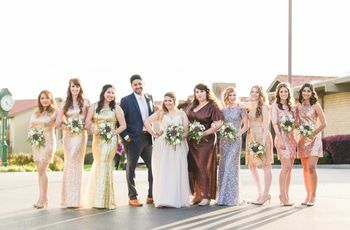 So yes, while group texts are a popular way to communicate with a wedding party, they’re best used in smaller groups so things don’t get out of control. Your wedding party members may be located in different parts of the country, or even the world. If that’s the case, constant texting can get expensive. Whatsapp is a more affordable way to communicate with your wedding party, and it works well internationally. While the average wedding party has nine members, many couples have crews far larger. For super-big wedding parties, a private Facebook group might be your best bet as your main method of communication. It’s easy to share photos ("Do you like this dress?") and refer back to old posts, and it won’t cause your phone to constantly beep with messages. If you need to send an important reminder or announcement, Facebook Messenger is an alternative to texting as well. 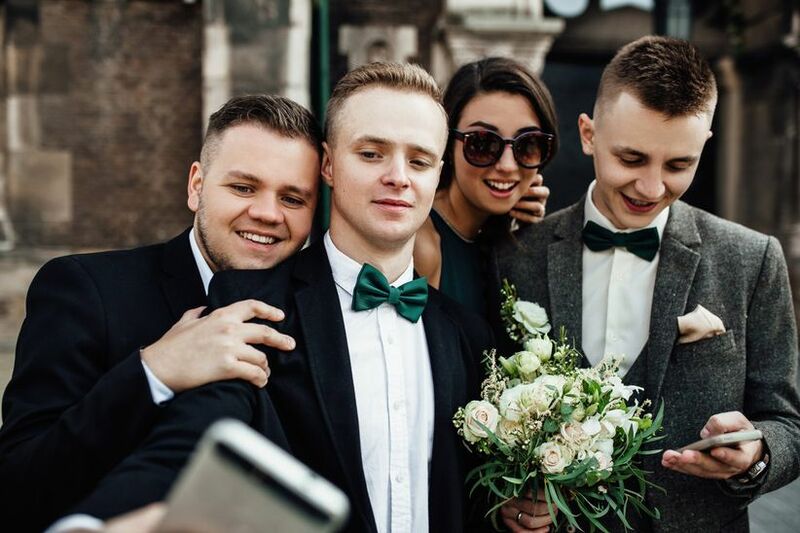 Of course, a Facebook Group is only useful if all of your bridesmaids or groomsmen are Facebook users (which isn’t a given these days), so if you want to go that route, make sure that all of your wedding party members can be included. Before the rise of texting and social media apps, email was the main method of wedding party communication—and it’s still quite effective. It may feel a little old school, but email works for groups large and small, won’t cause your phone to constantly ping, and it’s easy to search for old messages. 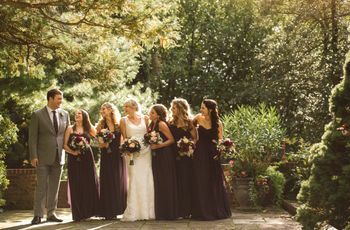 We think email works particularly well for communicating with the entire wedding party (bridesmaids, groomsmen, bridesmen, groomswomen, etc.) about important details of the wedding-day schedule, as well as planning pre-wedding events like bachelor or bachelorette parties and showers. It's also easier for your wedding party members to check their email if they work in from of a computer all day, while frequent texting would be more frowned upon. Is your wedding party helping you plan your big day? If so, you probably want to share lots of photos with them, from décor inspiration to dress ideas, and more. Creating a secret Pinterest board, shared with your innermost crew, allows them to view and comment on the photos you post, and add their own ideas. Your wedding party members can also utilize Pinterest among themselves as they plan your bachelor or bachelorette party or shower. It can be difficult to select dates for pre-wedding events, especially if you have many wedding party members with super-busy schedules. Doodle allows you to send out a survey to your crew and easily find out which dates work best for them, making that aspect of bachelor/bachelorette party and bridal shower planning a breeze. There are certain instances where a face-to-face meeting with your wedding party is necessary. Whether you’re introducing the gang for the first time or including a pal who lives far away on an in-person planning sesh with the rest of the group, video chat apps like Skype, Group FaceTime, or Google Hangout can be ideal. 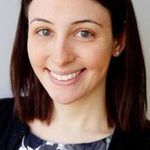 These video chat meetings can be even more effective than texting or emailing, but you’ll have to work with your crew’s varying schedules, which can be tricky. Your wedding party will likely take lots of photos throughout your wedding day, and you’ll probably want to see all of them. 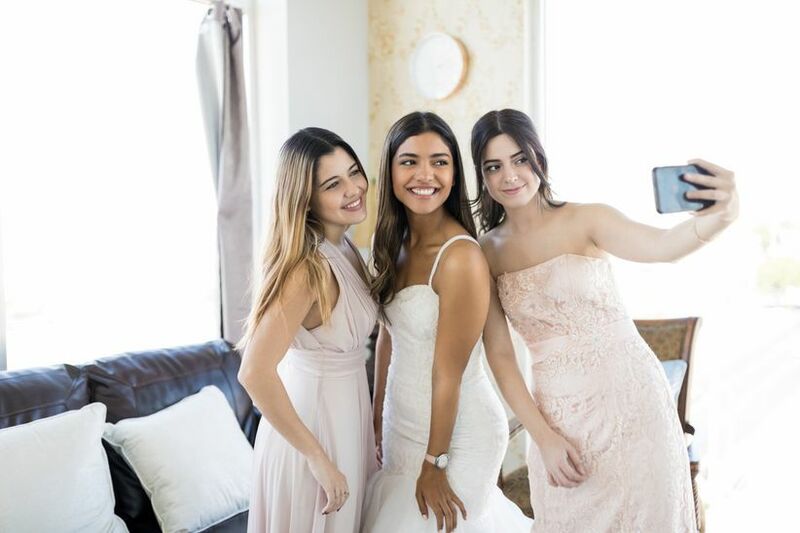 Photo-sharing apps like WedShoots make it easy for you to compile all of your guests’ photos, download them, and share albums with the entire crew. And—bonus!—you’ll have full control over the images that are shared, so you can delete those NSFW pics from the after-party, please and thank you.